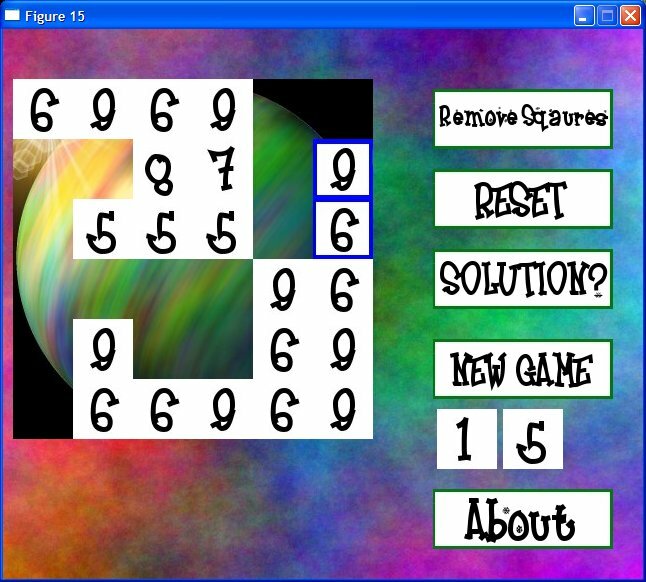 Fifgure Fiften Puzzle Game WINDOWS, remove buttons ito show the hidden picture underneath. Figure Fifteen is a game where you try and remove buttons that total fifteen. Remove your buttons in a logical order, otherwise all of your buttons will not be removed. Figure Fifteen is freeware and accepting donations. What makes Figure Fifteen unique is the freeware software is totaly customizable. If you want your own pictures underneath, just follow the enclosed directions to make your FIgure Fifteen game unique to you. Excellent sound effect make this game even more interesting! If you can make it here, you can make it anywhere!